We will custom design a platform to fit most any sailboat transom. The platform pictured here is for an Ericson 38 sailboat. Our sailboat transom platform pictured here is designed for boats with a single backstay bracket on the transom. 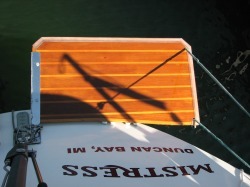 A stainless steel bracket slides between the backstay bracket and the transom. The platform slides into this bracket and is secured in place with two pins. The other end of the platform is supported by two lines that are attached to the stern rail and/or aft cleat. The platform will easily support up to 500 pounds. A handy feature of the assembly is a line with a carabiner which hangs under the platform. This handy clip can be used to attach a dinghy while loading or unloading, attach kayaks while at anchor or a net containing beverages to be chilled. The platform is ideal for the cruising sailboat and has many uses. It adds considerable safety to entering and exiting a dinghy, eases the installation and removal of an outboard on a dinghy, is a great diving platform for the kids and provides a place to stand while grilling. It can even be used as a "time out dog house" for that crew member in need of discipline. We are able to fabricate a transom platform for many different boat configurations. Send us pictures of your boat and we will suggest a design solution for you. The platform bracket is custom made for each sailboat. Our designers need to know the rake angle of the transom, the dimensions of the back stay bracket and the distance from the backstay bracket to the end of the transom. The platform can be made using either .75 inch marine plywood or .75 inch Starboard.